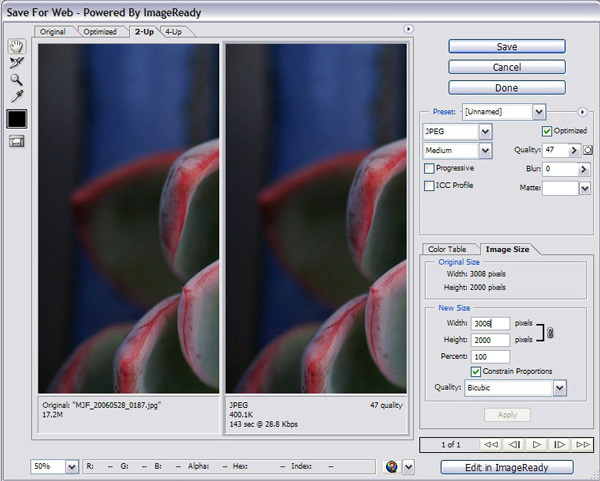 Although the screenshots in this example were made with CS2 (version 9), the process is essentially unchanged since at least Photoshop 6, and Photoshop Elements 3.0. 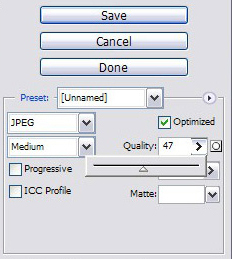 Save for web is good for making JPEGs at 72 ppi, the standard image formats for webpages, and is good for emailing images (posting photos at anything over 72 ppi is a waste of time, as browsers can't use the extra data, but have to load it anyway, resulting in slower image loads but no better image appearances). I've circled the 2-Up Tab (top left), this is useful for comparing the original image with the new image resulting from the options you choose. You can drag the image around to preview specific parts of the image. Below each of the image panels is some important information-- the file size and an estimate of how long it would take to load the image on dial-up. These numbers will change dynamically, depending upon what you saving options you choose. 3. If it's not already selected, choose the JPEG file format. 4. 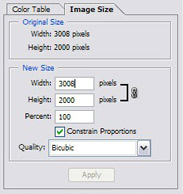 Select the Image size tab in the bottom right quarter of the dialog (below). 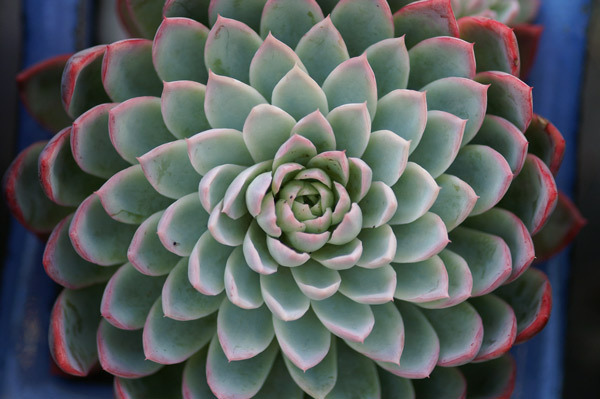 Choose an image size at which to save your image (remember to keep it to no more than 800 pixels on the long side for the forum. 5. Choose a quality level. Click on the quality level and a slider appears. Note the effect on the file size/loading time. 6. 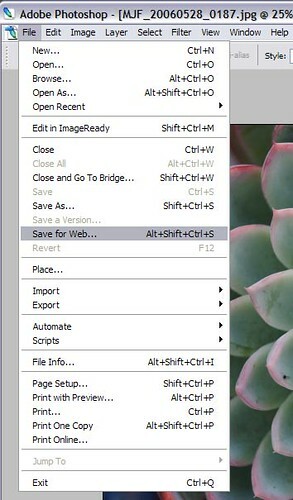 Click Save, and choose a location for your file on your drive. Upload to an online host and you're done!